Starting a new unit of work or responding to an exam question can be a daunting prospect for even the most confident of high school Art students. It is often difficult to ensure your work is totally original, especially if you have picked a theme that may already have been responded to lots of times before. It should be an exciting challenge to try and make work that is innovative and individual, but sometimes avoiding cliché can be difficult. When your work is assessed, there isn’t a box to tick that says you need to avoid the cliché in order to be successful. However, arts-based students should be aware that markers, assessors and university/college interviewers are likely to have seen countless portfolios containing similarly themed work. Those assessing your portfolio often become oversaturated seeing huge amounts of work, so it is important to stand out from the crowd. 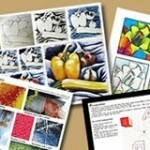 Your portfolio has to prove that you are skilled, alongside showing that you are an originator and innovator of ideas. To help you avoid making cliché responses to a theme or exam question, this article looks at the artwork of A Level Photography student Ella Kasperowicz from Thomas Alleyne’s High School. Her response to the ‘Built Environment’ question from the A2 AQA A Level exam paper was innovative, creative and meaningful. Ella was awarded full marks (100%) for both AS and A2 Photography and gained an A* grade overall. The Built Environment is a theme that has been used exhaustively in the past. Students often think they have to interpret a theme in a million different ways and draw / photograph one unrelated thing after another, however this can result in disconnected and incoherent outcomes. The key to success in responding to any theme/question is to ensure that you experiment in lots of different ways, but spend time making important, discernible decisions about which ideas and techniques will be the best to develop into successful and meaningful outcomes. Ella’s work has a lot of experimentation and, crucially, a confident and clear progression of development that answers the exam question while creating a personal response. Ella’s work is made more individual through her incorporation and development of textiles with photography. The combination of creative disciplines enables Ella to make unusual responses to her ideas and convey meanings and messages that are sophisticated and individual. Ella’s initial photographs taken in response to the Built Environment (examples shown below) were shot in New York. 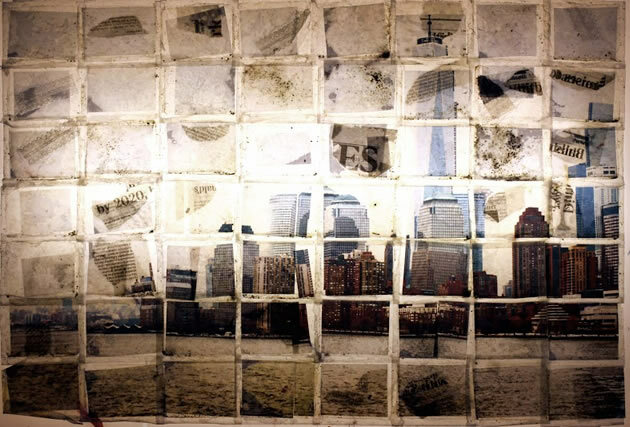 The photographs, which were a logical and conventional start to the unit, changed entirely by the end of her project and were used as a means to carry challenging ideas and meanings concerning the changes in the built environment in New York post 9/11. It can be difficult to create work that references serious global issues without being too blatant. 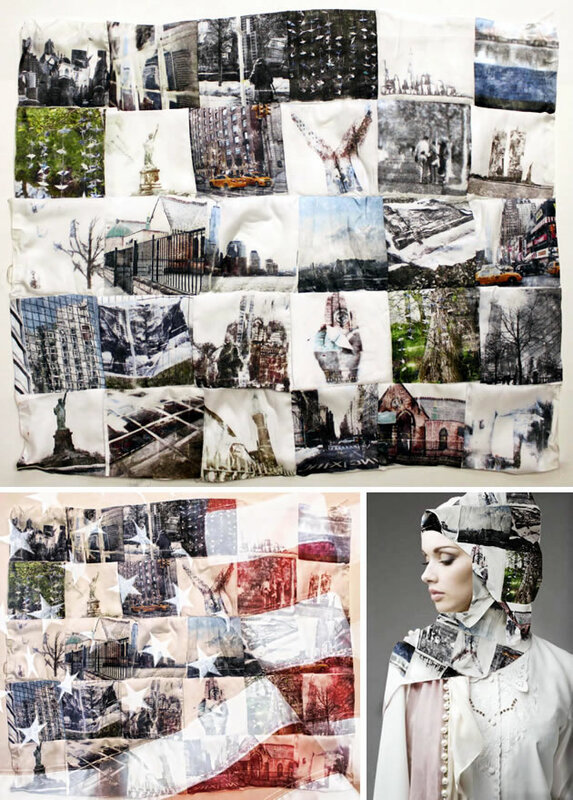 Ella’s headscarf/hijab and patchwork quilt (shown below) create a subtle and intriguing way of challenging the viewer to respond to the varying views surrounding 9/11 without directly using images that are too suggestive or offensive. 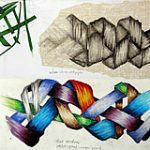 The images above show how textile techniques have been mixed with photography to create innovative and meaningful outcomes in response to an idea / theme. The patchwork quilt wasn’t only selected as a means to incorporate textiles – it was relevant for its cultural significance. In many cultures, a patchwork quilt is used as an object/device for sharing stories and social history. By using the idea and symbol of the quilt, Ella was able to create an object of greater context and interest that was as much a document of social history as it was a piece of artwork to resolve her ideas. 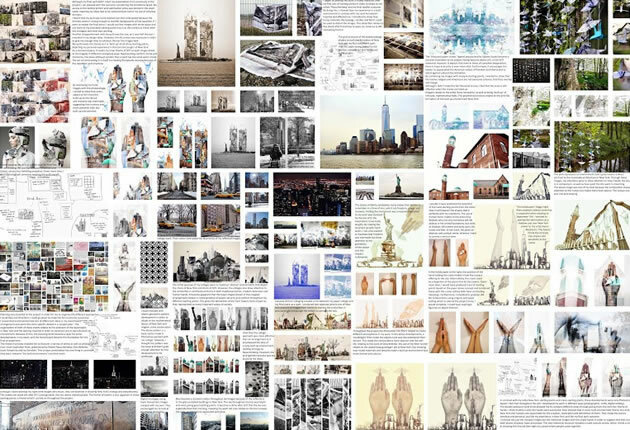 The image above is a large stitched piece containing printed images of New York`s built environment. 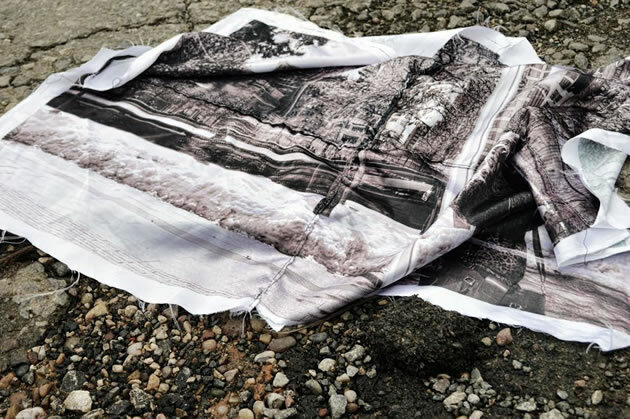 The piece was photographed on the ground and intended to act as a fallen flag to symbolise the destruction of the twin towers. These ‘handscapes’ mix landmarks from both the UK and US into rebuilt images from different urban environments. In the images above and below, Ella recreated images of built environments out of photographs of hands layered into different positions. The handscapes form new environments which create a new potential and possibility for the viewer. These images are both of reassembled landscapes which have been built up from different images throughout investigations that are relevant to her ideas/ exam question theme. If you are starting a new high school Art project or want to avoid the cliché in your own artwork, the 9 steps below may help you avoid the obvious and create something original. Research common and cliché responses to the theme you intend to explore, so you know what to avoid in your own work. Create an extensive moodboard and plan of different artist ideas and imagery to refer to as you develop your ideas. This is an essential part of the planning process and allows you to creatively combine research, inspiration images and annotated ideas together. 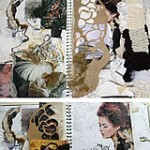 Your moodboard and initial plan are also an effective way of showing examiners your initial ideas and thoughts. 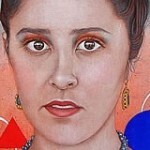 Make the time to explore current artist work as well as traditional artist responses to a theme. Have a broad research base and look on sites other than relying on Google to be your sole source of influence. Sites like Behance, Flickr and Carbonmade, Talenthouse, ArtServed etc are all continually updated and full of creative inspiration to get you inspired. Look for successes in places that might be overlooked. Take the time to review your work by yourself and with others to target areas of development that you may have missed. Don’t just stop at one outcome. Think about how you can redevelop your work in other ways, which could push your ideas further and create a more individual response. Keep an open mind when you develop your work – don`t try to force yourself too much in one direction. Be open-minded to new ideas and exploit these in your work. You will always be more personal and innovative if you can be free to develop your ideas on other tangents. 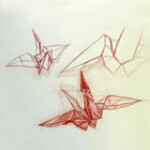 Remember that you can develop ideas in many different ways using unexpected mediums and processes. For example, photography students may approach image-making without a camera and think beyond the conventional photography. In Ella’s case, textiles and craft skills were just as essential to the development of ideas as her initial photographs. Be experimental… but always take the time to select the best media and techniques to further develop your work into the most meaningful outcomes. The piece above was made using the technique of wax-teabag trapping. A large image is cut into many smaller images and then placed into individual tea bags. The teabags are then glued together before an iron is used to melt wax onto the teabags to permanently seal them inside. This creates a fragmented image that has an unusual frail and distressed quality to it. Were you concerned about making cliché work? Ella: In a way yes; I like to be original and combine different elements of design in each project I do. Often I aim for my outcomes to be quirky and alternative so that there is little to compare them to, which I hope makes my work more interesting to look at. What steps did you take to avoid making work on a theme that had already been done? Ella: I was initially worried that the New York and 9/11 theme for my photography work had been overused, so instead of just focussing on the study trip I looked at how it affected me, linking my experience in America to home. My project thus is a reflection of my journey, making it personal to me. I also wanted to address how the 9/11 disaster predominantly led to unity of cultures, using Islamic, Japanese and Western components in my collage work. It was inspiring to me how people managed to still find hope in a time where a nation was broken. 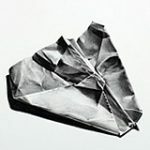 As well as conceptual originality, a combination of materials and unusual processes like waxed teabags, fabric printing and origami made my work a completely fresh interpretation of the theme. Ella: Overall I was pleased with the connections that make seemingly completely different images fit together in the same theme – ideas like hope, repetition, architecture and comfort. Specifically I enjoyed the collage work and invention of the ‘handscape’ the most, and the way I was able to combine photography with applied art. What did you do to finalise your project? Ella: At the end of the project, I swapped all of the images and artist research in my mood board for my own images and analysis. It felt an adequate way to conclude the journey by showing the start point and end point in the same form. This is an example of a recreated moodboard made by Ella, following the same format as her original moodboard. This was great for the examiner to see from a creative point of view and shows a refined visual summary of her work made in response to the exam question. What tips would you give to students before they respond to a unit of work? Ella: I would say that you should go into a project with an open mind. If you know exactly what you want the outcome to look like before you start, then you don’t give yourself the chance to explore and experiment with lots of different materials and techniques. I would also advise them to stock up on double sided sticky tape and befriend the suppliers of it! Would you change anything differently if you had the chance to respond to the theme again? Ella: In an ideal world I would have loved to have gone back to New York to take more photos! I used the trip as inspiration for the project and if I would have known I was going to take the approach I did I would have photographed paper cranes around the memorial, visited the memorial at night and asked people’s opinions on the disaster whilst I was there. A talented and driven student, Ella’s portfolio was strong enough to allow her to gain direct entry to university, rather than taking a Foundation course first (this is a one year course taken by most Art students in the UK, prior to beginning a university degree). 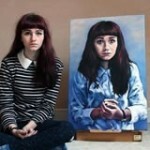 Ella is now studying an Illustration degree at one of the top universities in the UK for Photography and Illustration. George has been a teacher of GCSE Art & Design and A Level Fine Art and Photography for nine years at Alleyne’s Thomas High School in Uttoxeter, Staffordshire, UK. George has a Foundation and Higher National Diploma in Fine Art, a Bachelor of Fine Art and a Post Graduate Certificate in Education (PGCE). 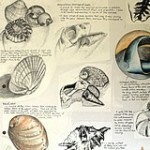 He is an experienced teacher of the AQA Art and Design curriculum.